Mikayla Robinson was so inspired by the compassionate care she received from a 340B safety-net provider that she now is part of their caregiving team. 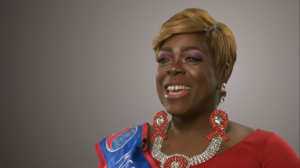 Mikayla first came to Equitas Health, a federally qualified community health center based in Columbus, Ohio, when she was diagnosed with HIV in 2006. With the help of care services from Equitas and access to affordable medications, her health has improved to the point where she now has an undetectable viral load. This means she not only is healthy but also cannot transmit the virus to another person. Today Mikayla helps many others in the community who are in similar situations. She works as an engagement specialist for the Mozaic program, an Equitas Health initiative focusing on health and wellness for transgender and gender non-binary/non-conforming people of color ages 13 to 29. Through community outreach and support, Mikayla and her colleagues focus on offering prevention and treatment options for young people who are at risk for HIV, homelessness, and suicide. Mikayla is the newest profile in our Faces of 340B video series. In 2018, Mikayla was recognized as the new Miss Gay Ohio, citing her community outreach for the Mozaic program as a major element of her pageant platform. When she sat down with us to tell her story, she proudly wore her pageant attire, complete with sash. 340B is essential to Equitas Health’s ability to provide affordable pre-exposure prophylaxis (PrEP) to patients at high risk of contracting HIV as well as HIV medications for those who have tested positive. Savings from the program also go toward funding additional medical and behavioral health services for people who can’t otherwise afford them, making Equitas a “one-stop shop” for the essential care that a patient might need, Mikayla says. Mikayla says she would be one of many patients who would be hurt if 340B were cut back or eliminated. Her ability to stay healthy depends on daily doses of Triumeq, which she would not be able to afford if she lost access to the discounted rate that Equitas offers for HIV medications. “I probably wouldn’t be able to live and survive and … stand here as an advocate for the community,” she says. “We need these services, and we hope that they will stay around, and we hope they will never go away,” she says. Check out Mikayla’s video profile at our Faces of 340B website.